Chewy's Urban Exploration - St Joseph's Seminary/College, Upholland, Wigan, Lancashire. It was to be the Seminary serving the North West of England. (the geographic centre of the Diocese of Liverpool). The first Junior Seminary of the Diocese was founded at St Edward's College in 1842 as a Catholic 'classical and commercial school' under the direction of the secular clergy. It was established in Domingo House, a mansion in Everton. Its President for the next forty years was to be Monsignor Provost John Henry Fisher. When the Junior Seminarians moved to St Joseph's the school was taken over by the Christian Brothers..
(who ran St John Rigby College in Orrell) and continues to this day and now serves as the Liverpool Cathedral Choir School. In recognition of the heritage owed to St Edward's College one of the two chapels at Upholland was consecrated as the St Edward the Confessor Chapel. Along with Ushaw College (the other seminary in Northern England) scholars for priesthood studied and were ordained at the college. Up until the second Vatican Council boys as young as 11 years of age entered the Junior Seminary before progressing to the senior Seminary at 18. In 1972 following the changes of Vatican 2 the two junior seminaries of St Joseph's and Ushaw merged at Upholland, and in 1975, with declining numbers from Ireland offering themselves for the (now) Archdiocese of Liverpool the Senior seminary moved to Ushaw. St Joseph's continued to offer boarding school education for boys considering a vocation until 1987. Up to 1991, the building housed a small group of students who were still interested in a vocation to the priesthood, but rather than being schooled within the premises, they attended St John Rigby College, Orrell. 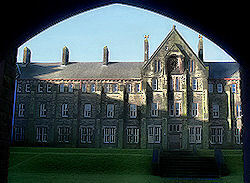 Following the end of the seminary training and boarding education St Joseph's became home to the Northern Institute and was used as a retreat and conference centre for the Archdiocese under the leadership of Msgr John Devine. I know of only one way to begin this letter, and that is by telling you directly that, together with the Trustees of the Archdiocese, I have decided - and the decision will take effect from November 30 - that we should no longer continue to use the buildings at St Joseph's College, Upholland. My words are chosen carefully: I say that 'we should not'- not that 'we cannot' - continue to use them. In fact it would not be impossible to finance their continued use: if we were prepared to set aside many other diocesan developments and activities, the money could certainly be found. However, I am convinced that that is a path I should not follow. For several years now one attempt after another has been made to find a way to maintain and develop the buildings, without detriment to other aspects of life within the Archdiocese; but, despite huge efforts, we have got no where. At the same time, careful note has been taken of the actual use made of the buildings by the Archdiocese, and we have found that, given their size and the amount of work and money expended on them, the usage has been very small. Moreover, it is clear that alternative venues for more or less all current activities can be found elsewhere. Indeed, there is a strong argument that it would be to our advantage to use other venues, which would, for example, provide greater ease of access for those with special needs and would be more readily accessible to those who must rely upon public transport. I need hardly tell you that this has been a most difficult decision to make. I will long remember the last time I heard Archbishop Worlock speak at Upholland. He made two points very clearly: first of all, that he would not be looking to the parishes to find any more resources to maintain the buildings: but, secondly, that he was hopeful that other avenues were opening to provide the necessary funding. As I walked through the building on that day, I saw how little of the vast space was in use: the task being faced was enormous. Sadly, his hope about those new avenues, despite every effort, has not been fulfilled. Of course my difficulty has been the greater because, as I am only too well aware, Upholland has not been part of my life as it has been part of the life of so many others. However, I return to that crucial word 'should', which I used at the beginning of this letter. Today is Home Mission Sunday and with it comes the challenge that can never be ignored: we are all called to the task of spreading the gospel, of making disciples here at home. That in turn means that I am not free to use the Archdiocese's resources in any way I please. I may use them only in the way that will most effectively initiate and develop enterprises which strengthen us all as disciples and heralds of the Lord. The special collection today supports the work of the Catholic Missionary Society, and it's helpful to recall how this Society, so important in the eyes of Cardinal Heenan, has so often and so effectively changed to respond to new situations in which the gospel in its fullness must be preached. I believe that at this time the Archdiocese is summoned to change for the sake of the gospel. May I commend to your grateful prayers all those, especially Monsignor John Devine, who have worked so hard to retain the use, and exploit the potential, of the Upholland Buildings. We thank God for the blessings that those buildings have brought the Archdiocese in the past. But now it is by change, in response to the 'signs of the times', that we can be assured that we shall receive his blessings still.